Let's outline the approach and clarify some misunderstandings. Even though François Baucher is one of the most controversial French riding masters, the modern classical approach owes him one of its founding principles: the separation of hand- and leg- aids. Former Saumur chief-rider and Olympic dressage competitor General Jean-Charles-Edmond Wattel (1878-1957) introduced this system of aids to the Cadre Noir. As the legs are responsible for creating and maintaining impulsion and the hands for regulating and directing it, a simultaneous interaction would only irritate the horse. Whereas in the German approach the horse is constantly kept in balance between hand and legs, since Baucher the French approach strictly separates the action of both kinds of aids, even though the alternation of them can and must be done in short successions to get the horse into collection. In traditional French equitation the rider tries to reduce the number and intensity of the aids to what is necessary. For example instead of pushing every step with the calves, the legs just give brief, but clear contacts to produce impulsion. These can range from “a blow to a mere vibration” (Decarpentry). Colonel Challan-Belval’s important words demonstrate the springboard of classical French equitation: impulsion. “No impulsion, no horse,” L'Hotte remarked, as for him a lack of impulsion affects all actions of a horse in a negative way. Consequently Challan-Belval (whose book “Dressage” is based on L'Hotte and Decarpentry) speaks of impulsion as “the first and last quality which one looks for in a horse and without it nothing exists.” He defines impulsion as an attitude of the horse (naturally existing or trained) which shows in an ever-existent will to go forwards with all his energy and physical strength. Decarpentry even speaks of “a physical need for the ready trained horse." If impulsion is the springboard, the question is how in the French approach it should be channelled and maintained. Naturally this happens through the hands of the rider connecting with the mouth of the horse. The way the French approach gets in contact with the horse's mouth is different from the German one, as it is influenced by François Baucher's second method and highlights the great respect the French classicists had and have for this part of the horse's body. In the French school the rider determines the tension of the reins which he sets against the impulsion coming from behind into the rider's hands. Because it is the rider that decides the tension, the horse meets the resistance and rewards himself by yielding in the lower jaw and taking the bit. So only an appropriate tension of the reins enables the rider to communicate with the horse's mouth in a way that leads to what the French call the “mise en main.” This term could maybe described as “push off the bit / take the bit” in the German approach, only that the latter uses it a bit differently. The "mise en main," the yielding of the lower jaw to the bit, describes the relaxation of the horse's mouth which for the French is the indispensable precondition for the entire horse being relaxed and so able to work properly. It's the starting point of everything. If the mouth is not relaxed, the effects can probably be compared with the effect clenching teeth has on a human being. The jaw muscles will get tense, affecting the rest of the body. So when the horse takes the bit, it swallows which causes the jaw muscles to relax. In the moment of yielding the horse “makes a movement of the tongue similar to the act of swallowing. It is slow and supple and induces slight salivation” (Decarpentry). During this process the bit/s is/are briefly uplifted by the tongue and come down again, producing what L'Hotte called “a discreet murmur.” One often reads in French equestrian literature the description that the horse “tastes the bit” like a treat. The acceptance of the bit causes the horse to slightly open its mouth for the moment described above which is only possible with a horse wearing a correctly fitted noseband; probably the reason why in French equitation the simple French/English noseband is the one most used. In the German approach the acceptance of the bit is of course as important as in the French, but it is preferably achieved with a closed mouth, even though Decarpentry made clear that the slight opening is “not to be mixed up with any persistent, jerky (…) opening of the mouth.” But the horse can only show this desired behaviour of taking the bit/s if the rider releases the impulsion coming from behind by slightly opening his fingers in the exact moment the impulsion meets the horse's mouth. If the rider misses these moments or even pulls backwards the horse's mouth will not be relaxed and will show its displeasure first by gaping, and then later by becoming stiff and defensive. For the French any resistance to the bit/s only shows that the horse lacks the necessary physical and mental relaxation. Instead of suppressing these signals of the horse by a tight noseband Decarpentry suggests “relaxing the mouth." The relaxation of a horse's mouth in the French approach can be done by hand-work (flexions) or for example by riding lateral work in walk to make the horse yield in a comfortable way, first described in de la Guérinière's “Ecole de cavalerie”. As a common rule one can say that the better the poll of a horse can be flexed, the fewer are any disadvantages when the neck gets lifted. To increase the suppleness and flexibility of the poll the French practice a lot of lateral flexions. What exactly happens when riding the horse through the neck is described precisely in “Academic Equitation”: “When the horse brings his head close to the vertical, the first vertebrae, the axis and the atlas will be uplifted from behind to front and flex over one another.” This way the base of the neck is uplifted so that it does not sink down between the shoulders of the horse and as a result the withers are uplifted as well. But this procedure remains fruitless if it is not connected to a lowering of the haunches. 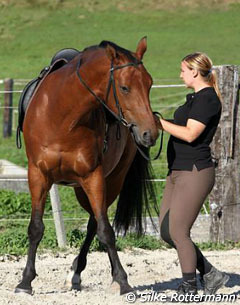 The picture of a totally elevated horse with sagging back and dragging hind-legs is the one which is repeatedly expressed when people are asked for their opinions of French equitation. It happens mainly when the neck is uplifted by the hands only and without getting the horse near the vertical, as Baucher described it in his second method. It's a long-held myth that the French ignore the horses’s hindquarters and nothing is more untrue: without having the region of the loin and the hindquarters strengthened sufficiently so that they are able to carry the load which is put on them by lifting the neck," warned Decarpentry, "the positive effects described earlier will not happen. For him the lifting of the neck is only one part. After him the neck can only be lifted in the proportion the horse is able to lower the haunches. 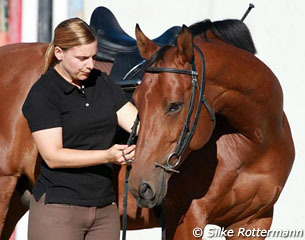 Also lifting of a horse's neck will only lead to the desired effects when the horse remains there without further support of the rider's hands. This only happens when there's a lowering of the haunches and sufficient impulsion, driving the horse forwards-upwards and freeloading the shoulders. Nothing seems to be more controversial to horse people who have not studied the methods of classical French equitation than the lifting of one or both hands in the process of bringing the horse onto the bit or into elevation. Any lifting of the hand always has the effect that the bit pressure moves away from the tongue onto the corners of the lip. In an equestrian world that unambiguously cherishes the deep hand position for a long time, it is understandable that the picture of a rider raising his hands causes confusion right up to rejection as it contradicts with one's own equestrian principles. 1) Make the horse yield: Lifting the hand unilaterally, while for example having the horse on a bent line, helps the horse to yield and come into the “mise en main”. As soon as the horse reacts and takes the bit, the hand is lowered again as now the pressure on the tongue is minimized after the jaw has yielded. 2) Bring the horse into the “ramener”: The ramener-position of the head can be get by advancing the horse's ears above the bit “thanks to an intelligent resistance of the rider’s hands against the impulsion” (Challan-Belval). It causes the horse to round the neck and seek a downwards contact. 3) Lift the head: This a controversial technique descending from Baucher's second method. The rider raises the hands with a bent elbow position towards his body to bring the horse's head up. Executed by riders lacking outstanding skills and sufficient experience and moreover done with a horse not properly taking weight behind, it can easily have the damaging results which leads to observers to reject the picture it causes then: A horse with a hanging back and dragging hind-legs. It is exactly the mistaken or excessive use of this technique that has made some riders suspicious of French equitation. But if correctly done, with the right timing and lots of rider's tact, the horse will yield with the lower jaw and arch the neck. Bringing the horse into the ramener-position is only useful when it has reached a certain degree of what the French call “rassembler” or collection. Decarpentry explains that rassembler is nothing but “the collection of the horse is a provision that effects all parts of its body and places each of them in a way to assure the best results of the efforts the haunches do.” Front- and hind-legs draw nearer to each other which is possible as the flexibility of the hind-legs is increased to the point that the haunches are visibly lowered. In the rassembler impulsion is transformed by the correct usage of the hands from a forwards into an upwards thrust. The hind-legs step more towards the centre of gravity. As a consequence the horse's forehand is lightened, the horse becomes visibly higher in front and close to the vertical. That way the withers are uplifted, an indicator for the degree of collection. The horse is now not only in total balance, but has also reached the maximum of suppleness. This suppleness has its origin in the relaxation of the mouth, so there can be no real collection without a relaxed mouth happily tasting the bit. Again, in principle, this technique is not specific to the French approach, but had already been recognized by the German masters Ludwig Hünersdorf (1748-1812) and Gustav Steinbrecht (1808-1885) who both said that a correct contact is always the precondition of any collection. What is interesting is that in the French approach the authors repeatedly emphasize that to obtain this perfect balance (that is the rassembler) it is indispensable that the rider has destroyed not only all physical resistances in the horse, but also the mental ones. This means that in the French classical equitation the highest form of collection is ideally wedded to a totally relaxed horse. Looking at old paintings or even seeing certain French-influenced trainers ride one can sometimes observe that the reins seem to be sagging compared to the tension which is now more usual, leading to another misconception: that in the French approach the horses are ridden with no contact. The rider relaxes the pressure of the fingers on the reins and the one of the legs to keep contact only at the weight of the reins while the horse continues some strides in his attitude in whichever movement it may be. The French also call it the horse being “en parole”. The “descente de main” accomplishes two things: firstly it is a reward for the horse which is let “alone”; secondly, and most importantly, it is , proof for the rider that the horse is in perfect balance and self-carriage. In this way it is the achievement of perfect lightness, the highest goal in the traditional French equitation.